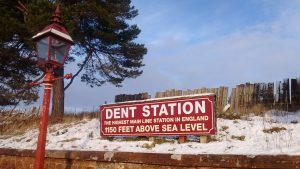 Dent Station is on the famous Settle to Carlisle railway and is the highest mainline station in England. Currently, five trains a day from Leeds to Carlisle stop at Dent and the station is served by the same number in the opposite direction. Please note that the station is four miles from Dent village. There is a limited bus service on Saturdays only (and Sunday in the summer – yet to be confirmed for 2018) and no taxis. There are no facilities at the station apart from a waiting room on each platform. There is a limited bus service from Oxenholme station near Kendal on the West Coast mainline as far as Sedbergh (5 miles from Dent village) Monday to Friday, plus one bus on a Wednesday and three buses on a Saturday to Dent village.